On September 11th, Partnership for a Secure America held an off-the-record dinner for participants in the Congressional Partnership Program with former Secretary of Homeland Security, Michael Chertoff. Mr. Chertoff discussed today’s homeland security challenges including the rising threat of cyber warfare and the spread of terrorism post-9/11. 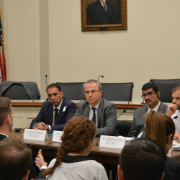 Started in 2009, PSA’s highly selective Congressional staff foreign policy and national security program – the first of its kind – runs two times each year. This opportunity provides professional development and networking to Democratic and Republican staff members on Capitol Hill to advance bipartisanship on national security and foreign policy. Through off-the-record events, policy seminars, and skills training, this unique program aims to equip Congressional foreign policy and security advisers to assess global challenges, build common ground, and achieve U.S. national interests. As a federal prosecutor Mr. Chertoff investigated and prosecuted cases of political corruption, organized crime, corporate fraud and terrorism – including the 9/11 terrorist attacks. As chief of the Justice Department’s criminal division, Mr. Chertoff was one of the chief architects of the USA Patriot Act. In addition, Mr. Chertoff served as a federal judge on the U.S. Court of Appeals for the Third Circuit. From 2005 to 2009, Mr. Chertoff led the country in blocking would-be terrorists from crossing our borders as Secretary of the Department of Homeland Security . He also transformed FEMA into an effective organization following Hurricane Katrina. His greatest successes have earned few headlines – because the important news is what didn’t happen. At Chertoff Group, Mr. Chertoff provides high-level strategic counsel to corporate and government leaders on a broad range of security issues. In addition to his role at Chertoff Group, Mr. Chertoff is also senior of counsel at Covington & Burling LLP, and a member of the firm’s White Collar Defense and Investigations practice group.